This photo is just one of many memorable images to feature in the ‘History of St Brigid’s GAC’ book that is being launched on Sunday 4th November with a coffee morning in the St Brigid’s Parish Hall after all Masses that day. The book will be on sale for £10. For more info, or if you wish to put your name down for a copy (or several!) of the book, please email stbrigidsbelfastpro@gmail.com or message us on Facebook. January 2004. Arsenal’s ‘Invincibles’ are well on their way to winning the Premier League without a single defeat, Will Young’s high-pitched, quivering voice is reducing men and women to tears all over the UK and Ireland with ‘Leave Right Now’ at the top of the charts, and Stateside George Bush is trying his level best to provide the writers of ‘Saturday Night Live’ with fresh material and ridiculous soundbites every week. Meanwhile, in South Belfast, the seeds of a St Brigid’s GAC senior men’s side are being sown as Conor MacSherry sets about trying to recruit anyone with enough fitness enthusiasm in order to field a team in Antrim’s Division Four and Junior Championship. 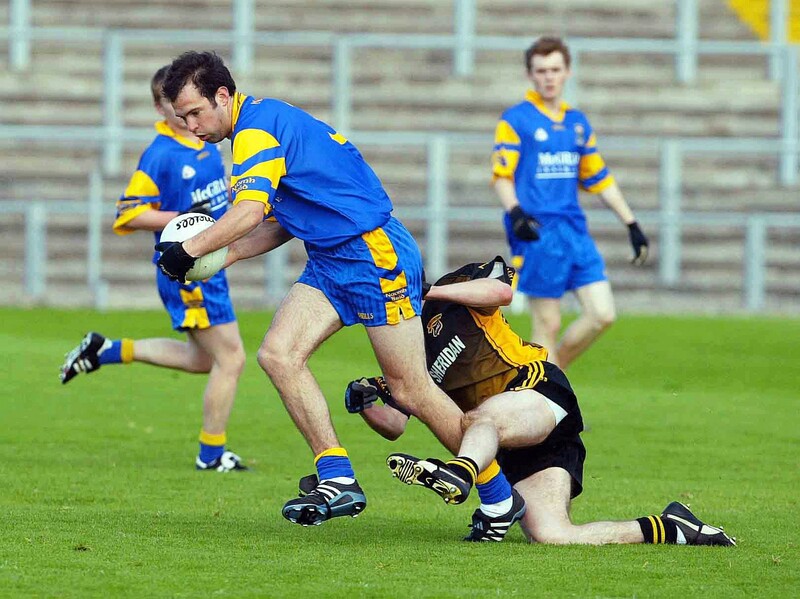 With a mixture of older, experienced hands – such as former Tyrone U21 player Eunan Conway and ex-Derry goalkeeper John Mackle – and players from the talented minor side of 2003 (such as James Loughrey and Ruairi O’Neill), the first St Brigid’s senior side took to the field for a challenge game against St Agnes’ in February 2004 and would go on to have a spectacular debut season. 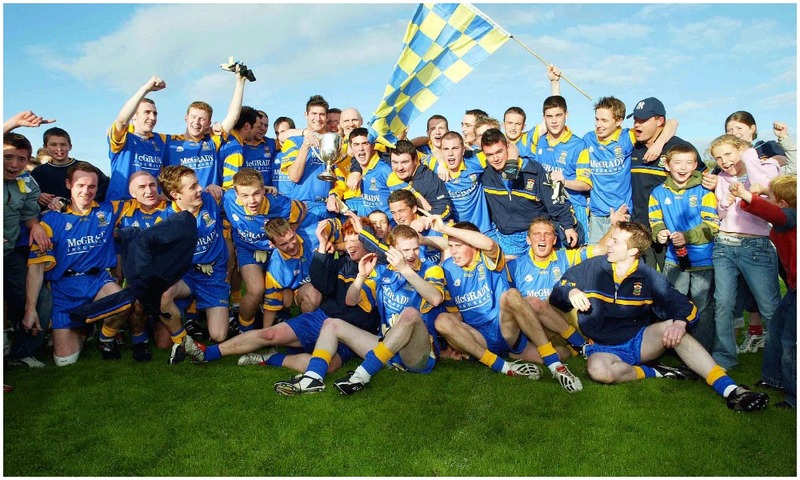 Gaining promotion from Division Four, MacSherry’s side defeated St Gall’s Thirds in the championship semi-final at Shaw’s Road and so set up a final against St Malachy’s at Casement Park on 18th September, 2004. The players emerged onto the pitch to be greeted by a stand filled with yellow and blue-clad spectators, and as the game got underway St Brigid’s showed little sign of nerves. Taking the upper hand early on, St Brigid’s controlled the game with a generally assured display. One notable incident occurred in the tunnel at half-time, when – despite preaching the values of “controlled aggression” before the game – St Brigid’s centre-back Eunan Conway “greeted” one of the opposing players rather too enthusiastically, almost causing a riot in the process. Nevertheless, calm heads eventually prevailed; and thanks to 0-7 from frees from Frankie Devlin, a goal from veteran Hugh Martin McGurk and a solid defence marshalled by Mackle and Richard Smyth (playing with a broken finger), as well as dynamic displays from Loughrey, Andy Magill in midfield and the McDonald brothers, Brendy and Paddy, St Brigid’s prevailed as victors (by 1-10 to 0-5) and brought the cup back to South Belfast.